Too Bad to Die (Hardcover) | Eagle Harbor Book Co.
November, 1943. Weary of his deskbound status in the Royal Navy, intelligence officer Ian Fleming spends his spare time spinning stories in his head that are much more exciting than his own life...until the critical Tehran Conference, when Winston Churchill, Franklin Roosevelt, and Josef Stalin meet to finalize the D-Day invasion. With the Big Three in one place, Fleming is tipped off that Hitler's top assassin has infiltrated the conference. Seizing his chance to play a part in a real-life action story, Fleming goes undercover to stop the Nazi killer. Between martinis with beautiful women, he survives brutal attacks and meets a seductive Soviet spy who may know more than Fleming realizes. As he works to uncover the truth and unmask the assassin, Fleming is forced to accept that betrayal sometimes comes from the most unexpected quarters--and that one's literary creations may prove eerily close to one's own life. 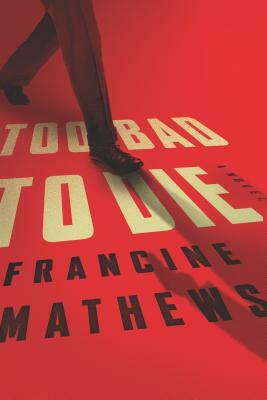 Brilliantly inventive, utterly gripping and suspenseful, Too Bad to Die is Francine Mathews's best novel yet, and confirms her place as a master of historical fiction.